According to a new market report published by Credence Research Inc “Electric Vehicle Market - Growth, Share, Opportunities, Competitive Analysis, and Forecast 2016 - 2022,” the global electric vehicle market is expected to witness double digit growth with flexible credit policies and governments’ efforts to reduce CO2 emission in developed and developing nations. Countries across the world are feeling heat from increasing economic burden to increasing fuel prices. Governments of developed and developing economies are looking forward to reduce their economic burden by reducing fuel consumption in respective countries. In order to achieve this, countries across the world are promoting the use of electric vehicles. In addition, several countries have introduced stringent emission control regulation to reduce green house gas effect and CO2 emission. All these factors are supporting the demand for electric vehicles across the world. High price of electric vehicle is limiting the growth of electric vehicles market. However, some countries have introduced flexible credit policies for purchase of new electric vehicle which is expected to overcome this market challenge. The market electric vehicle market was dominated hybrid electric vehicles in 2015 and is expected to maintain its dominance through the forecast period 2016 – 2022. Hybrid vehicle reduces fuel consumption by 20% to 30%. In addition, hybrid electric vehicle significantly reduces CO2 consumption and green house gasses. Increasing fuel prices and mandatory policies to reduce greenhouse gases (GHG) are also expected to propel the demand for hybrid electric vehicles across the world. The sale of plug-in electric vehicle grew rapidly in the last five years (2011 – 2015) with cost reduction, technology development, introduction of several models, and increase in charging stations. Electric vehicles are gaining recognition in the United States, Europe, Japan and some developed countries in Asia Pacific due to strong government support with introduction of credit policies for new electric vehicles and vehicle fuel efficiency regulations. Industry competition is growing steadily with as automakers across the world are looking to enter in this potential market. Automobile manufacturers are focusing on developing advanced models at competitive prices will increase the choices for consumer which is further expected to spur the demand for electric vehicles across the world. Some major players in the global market includes Nissan Motor Corp, Chevrolet, Tesla Motor Inc, Toyota Motor Corporation, The Ford Motor Company, Bayerische Motoren Werke AG, Volkswagen AG, Honda Motor Co Ltd, AB Volvo, Toyota Motor Corporation and others. According to a new market report published by Credence Research Inc., “HVAC Equipment (Heating Equipment, Ventilating Equipment, and Air Conditioning Equipment) Market - Growth, Share, Opportunities, Competitive Analysis, and Forecast 2015 - 2022”, the global HVAC (Heating, Ventilating, and Air Conditioning) equipment market is expected to expand at a CAGR of 5.6% from 2015 to 2022, exceeding US$ 125.0 Bn by 2022. The latest market report published by Credence Research, Inc. “Global Clinical Laboratory Services Market - Growth, Share, Opportunities, Competitive Analysis, and Forecast, 2016 - 2022,” the clinical laboratory services market was valued at USD 165.8 Bn in 2015, and is expected to reach USD 248.5 Mn by 2022, expanding at a CAGR of 5.9% from 2016 to 2022. The clinical diagnostic tests performed by laboratories can be broadly classified into four major categories, namely, clinical chemistry, medical microbiology & cytology, human and tumor genetics and other esoteric tests. Ranging from routine blood and urine tests to high-end genetic analysis including fluorescence in situ hybridization (FISH), molecular expression testing, etc., clinical laboratories offer numerous tests that help detect disease progression and abnormalities. The three major types of service providers in this market include hospital-based laboratories, clinic-based laboratories and stand-alone laboratories. With the increasing incidence rates of debilitating conditions such as cancer, diabetes and infectious diseases, the number of patients that will opt for such tests will continue to increase in the future and thereby increase the demand for these services. Moreover, the percentage of aged population in the U.S. is expected to grow to an estimated 20% by 2030. Such a large population of elderly people in the U.S. alone will lead to high testing volumes for clinical laboratories. Diagnostics manufacturers such as Roche Holdings, Genomic Health, Abbott Diagnostics, Qiagen, etc. are focusing their efforts towards developing products and systems that would enable highly accurate analysis of patient samples and also enable processing of thousands of samples at a time. This will help clinical laboratories to cope with the rising demand and in turn ensure revenue generation. The clinical laboratory services market is observed as the most diversified and competitive market comprising large number of players. The market is dominated by several players, depending on their major competencies. The key players in this market are Abbott Laboratories, ARUP Laboratories, Bio-Reference Laboratories, Bioscientia Healthcare, Charles River Laboratories, Genoptix Medical Laboratory, Healthscope, Laboratory Corporation Of America Holdings (Labcorp), Labco S.A., Sonic Healthcare Limited, Spectra Laboratories, Quest Diagnostics, Inc., Genzyme Corporation, and Siemens. According to a new market research report published by Credence Research “Industrial Weighing Equipment Market (Product – Bench Scales, Floor Scales, Load Cells, Belt Weighers, Checkweighers, Weigh Feeders, Truck Scales, Cargo Scales, Rail Scales and Others) - Growth, Share, Opportunities, Competitive Analysis and Forecast 2016 - 2023”, the global industrial weighing equipment market is estimated to expand with a CAGR of 5.4% from 2016 to 2023 to cross the US$ 3 Bn mark by 2023. The overall rising industrial growth coupled with the demand for automated and easy to operate weighing equipment is the prime factor fueling the market growth. With the steadily ongoing recovery of the global manufacturing sector, the overall demand for industrial goods (such as weighing equipment) is estimated to continue remaining strong in the coming years. Further prospects for the market include wireless weighing equipment and development of automated weighing equipment. Nevertheless, the market growth is majorly hindered due to lack product differentiation. The industrial weighing equipment market is quite competitive in nature with manufacturers focusing on increasing their global footprint along with providing high quality, reliable products. One of the major concerns for industrial weighing equipment is the longer lifespan expectancy of the products by consumers. The market has been witnessing single digit growth since the past several years mainly due to higher product life, ultimately resulting into lesser number of units sold. Thus, market players emphasize on developing advanced products so as to attract new customers. Additionally, weighing equipment providers offer rental/lease service to their customers. Another major area of focus is expansion of distribution network. According to a new market research report published by Credence Research “Baby Diapers Market(Product – Cloth Diapers, Disposable Diapers, Training Nappies, Swim Pants) - Growth, Share, Opportunities, Competitive Analysis and Forecast 2016 - 2023”, the global baby diapers market was valued at US$ 40.9 Bn in 2015 and is estimated to expand with a CAGR of 6.0% from 2016 to 2023. The era of using traditional cloth diapers is rapidly exiting, especially in India and China, thereby driving the overall baby diapers market growth. Increasing literacy, health awareness and rise in discretionary income are the prime factors responsible for the baby diapers market growth, especially in the developing economies. People are now more inclined towards providing better and gentler care/products to their babies. This has led to significant rise in competition towards offering better products at competitive prices. Another major factor fueling the market growth and competition is development of diaper products using better material providing better protection. The most significant factor bolstering the market growth is the rising birth rate worldwide. Although the overall birth rate per year is has decreased significantly since the past few years, the rate is estimated to remain steady in the coming years. India and China are the most promising markets for baby diapers mainly due to their strong birth rate (as compared to other regions) and rising awareness towards baby care products. Another major factor fueling the market growth is the rising discretionary income of people, globally. People, mainly in the developing economies, now have more interest towards buying branded baby products so as to ensure optimum quality of the products. Nevertheless, continued exposure to disposable baby diapers results in skin rashes and hence may have other impacts on baby health. This is one of the most serious concerns for baby diapers market. The global baby diapers market is consolidated in nature with a few major international players contributing to more than fifty percent of the total market revenue. The market players primarily compete on the basis of their products (material and comfort), price and brand-name. The prime source of product marketing is through television advertisements. Thus, major players across the worldwide invest special efforts towards marketing their products so as to ensure strong influence on their consumers. Another major area of focus for the baby diaper manufacturers is attractive packaging of the products. Attractive packaging plays crucial role in case of baby products as it largely helps driving the consumers. This makes attractive packaging is one of the most important strategies adopted by the baby diaper manufacturers. Further, due to rising penetration of online retail, majorly in Asia Pacific, companies are now increasingly promoting their products online so as to capture the consumer base. The latest market report published by Credence Research “Global Breast Biopsy Devices Market - Growth, Share, Opportunities, Competitive Analysis, and Forecast, 2016 - 2022,” the breast biopsy devices market was valued at USD 617.62 Mn in 2015, and is expected to reach USD 1,250.71 Mn by 2022, expanding at a CAGR of 10.6% from 2016 to 2022. Breast cancer is among the most commonly diagnosed non-skin cancer across the world, with among the highest annual mortality. While the incidence of the disease is increasing at alarming rates in the developing markets, the breast cancer survival prognosis is reported to be con tenuously improving this proving development in the trends of early disease diagnosis and treatment outcomes. Pathological detection of breast cancer has evolved a long way until present with biopsy becoming the standard route of disease detection. With the introduction of minimally invasive biopsy procedures, intimating with fine needle aspiration, the global breast biopsy devices market has witnessed phenomenal growth over the period. Rapidly aging population and the proven correlation of age with the incidence of breast cancer is among the biggest contributors to the breast biopsy devices market. Alarming disease incidence and technological development resulting in rapid adoption of breast biopsy devices and related solutions are observed to be the major market drivers in the developing regions of the world. Introduction of guidance enabled biopsy systems has further facilitated the market development and assisted in containment of breast cancer incidence. Te global breast biopsy devices market is consolidated with a few players dominating the major chunk of the market revenue. Players such as Hologic, Mammotome, C.R. Bar, Inc. are identified and recognized as the global market leaders. Other players such as Argon Medical Devices, Becton Dickinson and Company, Sterylab are the promising market players with their established positions in prime market segments. As reported by Credence Research, Inc. through their latest publication “Global Drug Delivery Technologies Market - Growth, Share, Opportunities, Competitive Analysis, and Forecast, 2016 - 2022,” the drug delivery technologies market was valued at USD 175.95 Bn in 2015, and is expected to reach USD 284.71 Bn by 2022, expanding at a CAGR of 6.9% from 2016 to 2022. According to a new market report published by Credence Research, Inc., “Home Energy Management Systems (HEMS) Market (Wi-Fi, ZigBee, Z-Wave, and Other Technologies (Insteon, X10, Wireless M-Bus, etc) - Growth, Share, Opportunities, Competitive Analysis, and Forecast 2015 - 2022”, the home energy management systems (HEMS) market is expected to expand at a CAGR of 22.3% from 2015 to 2022, reaching US$ 3,241.9 Mn by 2022. Home energy management systems (HEMS) are devices that allow home owners to control, monitor, and manage their electricity consumption optimally. The global home energy management systems (HEMS) market is currently in the budding stage of development. The industry has been determined to develop a universal platform capable of solving issues concerned with the interoperability, interface, and installation. The global home energy management systems (HEMS) market is concentrated and technology driven. The top four home energy management system manufacturers account for over 45 percent of the global market revenue. Panasonic Corporation (Japan), Honeywell International, Inc. (the U.S.), Nest Labs, Inc. (the U.S.), General Electric Company (the U.S.), and Vivint, Inc. (the U.S.) are identified as some of the leading players in the home energy management systems (HEMS) market. Other players including Alarm.com (the U.S.), Ecobee (Canada), EnergyHub, Inc. (the U.S.), Comcast Cable (the U.S.), EcoFactor (U.S.), and Cisco Systems, Inc. (the U.S.) have been marked as some of the promising and emerging players in the global home energy management systems industry. The market competition is characterized by the presence of both core solution suppliers and application sub-system providers. Their approach has been to offer energy management solutions as a part of home automation products and services. The new entrants in the home energy management systems market need substantial capital investment. Furthermore, to keep pace with the technological advancements, they are required to dedicate heavy budget for research and development activities. On the contrary, favorable government regulations promoting optimum electricity consumption is expected to have positive impact on the new players entering the market. As such, the market poses moderate threat to new entrants. The latest market report published by Credence Research, Inc. “Global Medical Imaging Equipment Market - Growth, Share, Opportunities, Competitive Analysis, and Forecast, 2016 - 2022,” the medical imaging equipment market was valued at USD 27,548.6 Mn in 2015, and is expected to reach USD 44,887.4 Mn by 2022, expanding at a CAGR of 5.4% from 2016 to 2022. The technology and process of creating visual representations of the body for clinical analysis and medical intervention of organs and tissues is known as medical imaging. The developing technologies, aging demographic trends, evolving epidemiological patterns, and changing patient care strategies are the major factors driving the medical imaging equipment market. The aging population will lead to an increasing level of diseases, and other health risks that are detected and analyzed through in vivo techniques. In the near future trends promoting value-based patient care approaches are expected to impact positively on the medical imaging equipment that yield fast and accurate testing results. Computed Tomography (CT) scanners are expected to generate the fastest revenue growth during the forecast period 2016 - 2022 due to increasing number of installed systems that might reach the end of their product life cycles and are will be replaced with higher value-added new-generation models in the near future. Thus, the technological advances in the field of medical imaging equipment market are trending towards manufacturing of cost-effective, minimally invasive, portable and precise equipments. GE Healthcare, Toshiba America Medical System, Philips Healthcare, Shimadzu Corporation., Siemens Healthcare and Hitachi Medical Corporation are the key players that dominate the global medical imaging equipment market. In 2015 it was observed that overall the market was highly oligopolistic in nature with the top three players accounting for around 50% of the global market revenue. The market experts suggested that the medical imaging equipment market is highly capital intensive and requires huge research and development expenditures, hence the well established companies with huge capital reserves are expected to the market throughout the forecast period. Rise in geriatric population and improving healthcare infrastructure in developing countries from Asia Pacific and Latin America such as China, India, Brazil, Mexico, Indonesia, Malaysia and others. The latest market report published by Credence Research, Inc. “Global 3D Bioprinters Market - Growth, Share, Opportunities, Competitive Analysis, and Forecast, 2016 - 2022,” the 3D bioprinters market was valued at USD 562.8 Mn in 2015, and is expected to reach USD 1,942.5 Mn by 2022, expanding at a CAGR of 18.8% from 2016 to 2022. 3D bioprinting is the process that allows researchers to generate and assemble cellular layers to form organic tissues. The use of biomaterial cells, proteins or other biological compounds as building block is carried out for fabricating 3D personalized structures or in vitro biological models through additive manufacturing processes. The major factors driving 3D bioprinters market are increasing demand for organ transplants, and requirement of cost-efficient technologies in drug development. According to the Organ Procurement and Transplantation Network (OPTN) and the Gift of Life Donor Program, in the U.S., an average of 21 people die every day waiting for an organ transplant, and the wait times can range from four months for a heart to five years for a kidney. The global 3D bioprinters market is represented by key technologies namely, syringe based 3D bioprinting, laser based 3D bioprinting, magnetic levitation 3D bioprinting, inkjet based 3D bioprinting and valve-based 3D bioprinting. Among these syringe based 3D bioprinting is the largest segment and is anticipated to maintain its lead during the forecast period 2016 – 2022. Pharmaceuticals segment accounted for a major share of 31.70% in the 3D bioprinting market. Drug development today is increasingly focusing on reducing side effects, improving treatment outcomes and deserting the ‘one-size-fits-all’ approach to medication management. According to market experts competition in 3D bioprinting market is low and barriers are high. Competition is low due to presence of niche opportunities in the healthcare industry and barriers are high because the research is very specialized and requires a significant amount of investment, usually by the government or private donors, while the risks to profitability remain very high. 3D Systems, Inc. and Stratasys Ltd. dominate the 3D printer applications in healthcare market. The other upcoming key players such as Organovo, Inc. and EnvisionTEC, Inc. are expected to be one of the leading players in 3D bioprinting market in the near future. According to a new market report published by Credence Research Inc., “Digital Signature Market (By Mode of Deployment (On-premise and Cloud-based), By End-use Application (Banking Financial Services & Insurance, Government, Education, Retail, Transportation, and Others)) - Growth, Share, Opportunities, Competitive Analysis, and Forecast 2017 – 2025”, the digital signature market is expected to witness a double digit CAGR during the forecast period 2017 to 2025. Digital signatures are steadily gaining acceptance across commercial, government and legal environments on account of their ability to limit operational costs, reduce contract signing process, and streamline the entire business workflow efficiently. Thus, digital signatures which substitute electronic alternatives for physical documents have become an efficient approach to speed up legal and financial paperwork. On the contrary, the global digital signature market faces challenge in form alternate technologies including vein biometrics, voice biometrics, and keystroke biometrics among others. Based on mode of deployment, the global digital signature market is segregated into on-premise and cloud-based solutions. As of 2015, on-premise solutions led the overall digital signature market accounting for just over 60% of the market revenue. However, the global digital signature market is witnessing a shift towards cloud-based solutions that allows users the flexibility to extend the number of signers as and when required. The research study expects cloud-based model to dominate the overall digital signature market by 2022. In terms of end-use, financial institutions are increasingly implementing digital signature-based processes on account of the benefits offered in terms of security, speed, efficiency, simplicity, and turn-around time among others. The global digital signature market is highly technology driven and competitive. The leading four players in the global digital signage market collectively account for less than 45 percent of the global market revenue. Thus, the global digital signature market is highly fragmented. The global digital signage market being technology driven, the degree of competition among vendors and other participants across ecosystem is expected to remain high throughout the forecast period 2017 – 2025. 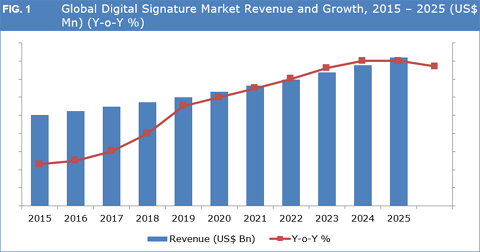 Some of the leading players identified in the global digital signature market include Adobe Systems Inc., Secured Signing Ltd., Gemalto NV, Ascertia, SIGNiX, Entrust Datacard Corp., RPost, eSignLive, IdenTrust Inc. DocuSign Inc., and Thales e-Security Inc. The global digital signature market also includes large number of niche players accounting for trivial market share individually. The latest market report published by Credence Research, Inc. “Tea Market - Growth, Future Prospects and Competitive Analysis, 2017 - 2025,” the global tea market was valued at US$ 24.3 Bn in 2016, and is expected to each US$ 37.3 Bn by 2025, expanding at a CAGR of 5% from 2017 to 2025. The global tea market has witnessed a significant rise in strategic mergers and collaborations among tea vendors. Such growth strategies are focused at augmenting their service portfolio. Large scale tea companies in countries such as Asia Pacific, North America, and Europe are increasingly indulging in tea manufacturing due to availability of resources, desire to reduce costs and growing need to focus on core competencies. With further expansion and consolidation activities taking place in the industry, steady growth of the global tea market is anticipated to continue through the forecast. Hostile promotional strategies implemented by tea producers, awareness of health benefits from consumption of tea has spread intensely across the globe. This, attracts people to start drinking tea on a regular basis, which helps to increase the demand for tea products globally. The overall tea market has a potential of around US$ 24.3 Bn in 2016. High growth of this space is due to the changing lifestyle, and increasing awareness about health. Black tea segment has the largest market share and will experience the fastest growth during the forecast period. Green tea segment is also anticipated to flourish due to growing consumer awareness for healthy and safe products. According to a new market report published by Credence Research Inc., “Hosiery Market by Product Type (Socks, Tights, Leggings, Pantyhose, and Others)” - Growth, Future Prospects, Competitive Analysis, 2017 – 2025”, the worldwide hosiery market was valued at US$ 29.73 Bn in 2016, and is projected to reach US$ 43.42 Bn by 2025, expanding at a CAGR of 4.3% from 2017 to 2025. The global hosiery market is witnessing growth due to rising concern about personal appearance and grooming. Furthermore, shift in retail format to hypermarket and supermarket is allowing consumers to select and compare products according to their preferences which in turn is fueling the sales of hosiery products. Besides this, ecommerce sector has witnessed robust growth in the recent past, which is providing easy access to the consumers to compare hosiery products online. The global ecommerce industry was approximately US$ 22 Trillion in 2016 and anticipated to witness strong growth during the forecast period. Thus, hosiery products are also projected to witness high growth in sales volume through ecommerce platforms. Increasing raw material prices is imposing challenges to the hosiery industry. Growing consumer awareness towards the quality and prices of various products due to growth in access to various retail formats and online platforms is providing consumers with choice of alternatives. Further, increasing consumer demand for high quality products at cheaper prices is projected to impose challenges for the hosiery products manufacturers. Increasing prices of raw material is shrinking the profit margins of manufacturers. Moreover, intense competition among global and regional players is restricting hosiery manufacturers to increase prices for their products which in turn is restricting new investment for expansion of production capacity of the hosiery products. The market is highly fragmented in nature. The presence of large well established and regional manufacturers makes the market highly competitive. They compete on the basis of product differentiation and pricing. Some of the major players present in this market are Hanesbrands, Golden Lady, Gilden Activewear, CSP International, Tefron and Wolford AG among others.